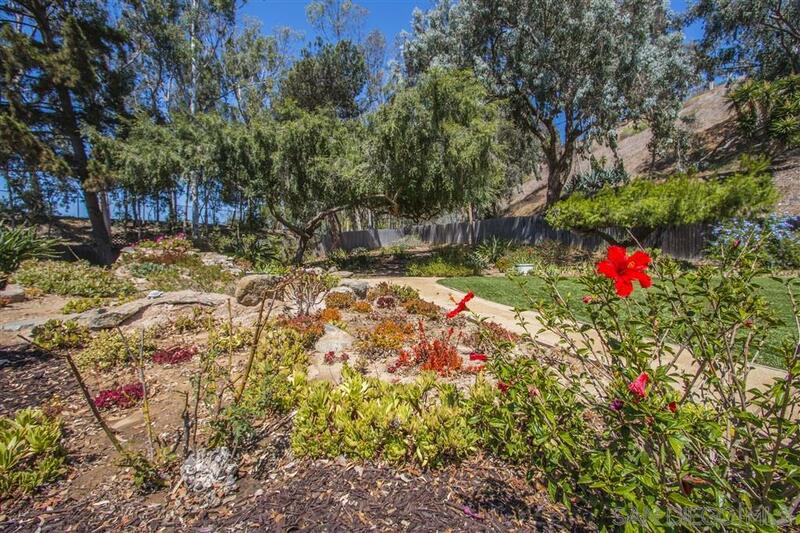 You won't believe the nearly 1-acre secluded, park-like backyard with multiple outdoor living areas & manicured landscaping. Look no more for an amazing place to entertain or relax in a private oasis. The spacious house boasts vaulted ceilings in the living room and beautiful elm wood floors. Gather in the oversized family room around the cozy stone fireplace. The layout features one bedroom with attached bath downstairs, with three bedrooms and one bath upstairs. Enjoy the best of indoor/outdoor living., The seller is the original owner and has taken great care of the home and garden over the years. Improvements include family room addition, central AC, updated kitchen with granite counters, upstairs bath redone, undersink water filter, alarm system, dual pane windows, additional insulation, artificial turf and drought tolerant landscaping. The most recent upgrades include newer driveway, patio pavers and patio cover, garage door and opener.